The day I argued Roe, the members of the press probably thought I was so young that I was unlikely to win. The only photo I have of that day was one taken by the staff of my Texas Congressman George Mahon. This photo is of Ron Weddington (my husband), me, Mahon, and my proud mother. Dr. Weddington has been involved in a variety of legal endeavors. Her practice has included a wide variety of legal matters and she has been certified as a family law specialist by the State Bar of Texas, though she is not currently practicing law. 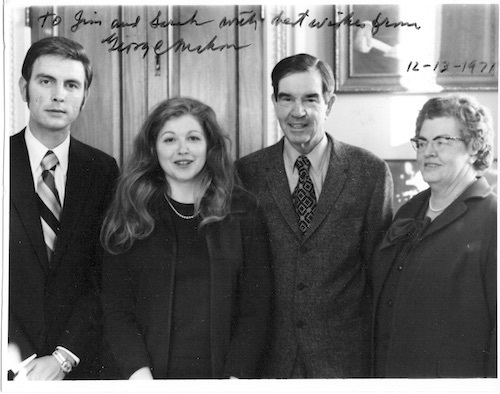 Dr. Weddington was the Assistant Reporter for the American Bar Association Committee to revise the Ethical Standards for Lawyers. That committee authored the Code of Professional Responsibility for lawyers, which was adopted by almost every state. 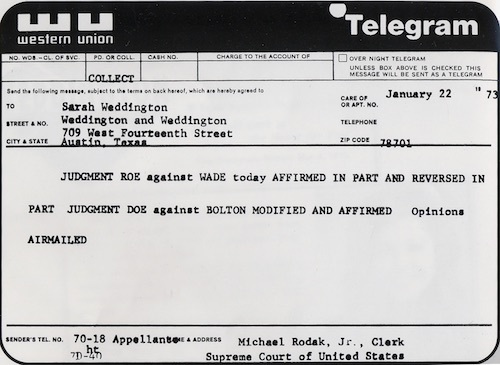 Sarah Weddington was also the winning attorney in one of the most famous cases in U.S. history: Roe vs. Wade. In that case, the U.S. Supreme Court held that there is a constitutional right of privacy for individuals to decide whether to continue or terminate an unwanted pregnancy. Dr. Weddington has always believed that government is not the appropriate entity to make such a decision. She is proud of having widened the scope of decisions that belong to women. Dr. Weddington's book, A Question of Choice, covers the history of the case and issue up to 1992. Audio of the oral arguments in Roe are available on the Internet at the Oyez Project provided by Northwestern University. Current Information about the abortion issue is available from, among others, the following organizations:The American Civil Liberties Union is actively involved in fighting for reproductive rights. NCJW's Campaign to Save Roe is a campaign to educate, mobilize, and advocate for a federal judiciary that will protect fundamental freedoms, including women's right to reproductive choice. Center for Reproductive Rights(formerly the Center for Reproductive Law and Policy) provides information on the status of reproductive rights in the U.S. and around the world.